A BMW "product genius" uses an iPad and display to show off the company's latest models. BMW announced its forward-thinking plan to integrate technology in the showroom in 2013, saying that its dealerships would one day boast iPads, monitors and "product geniuses." Now, over one year later, the project is finally taking shape, reports The Wall Street Journal. Expanding on its initial plans, BMW wants to do away with showroom cubicles and the usual dealership layout, replacing everything with a more customer-friendly experience. Most importantly, employees can be characterized as "definitely, definitely not salesmen," said the head of BMW's sales and marketing team, Ian Robertson. The new route is one borrowed from Apple's brick-and-mortar Apple Stores. Replacing high-pressure sales staff with young, knowledgable workers, Apple's retail model "shows" rather than "tells" customers about the company's products. Some BMW dealers plan to recruit "product geniuses" from local colleges. 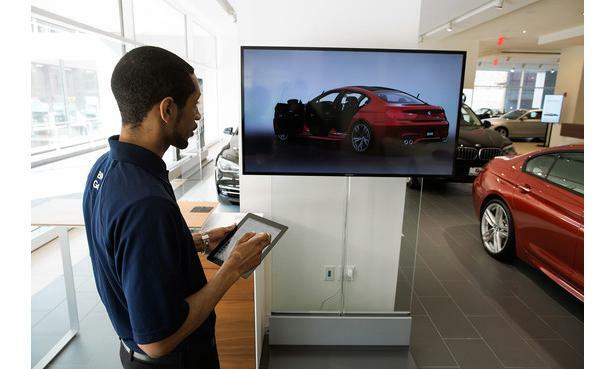 Also like the Apple Store, BMW's initiative calls for showrooms and employees to be kitted out with the latest Internet-connected tech, such as iPads and Apple TVs, for quick specification referencing and on-demand demonstrations. Part of the push toward a digital sales flow is the glut of car models and trim levels BMW will be rolling out this year. Mark Rikess, CEO of auto consulting firm Rikess Group, believes there may soon be two types of dealerships: those offering a traditional service-minded experience and new low-overhead locations that will rely heavily on Internet-based sales. The streamlined dealership Rikess describes would fit well with BMW's new initiative and could solve a number of logistics problems. According to the Peter Miles, BMW North America's executive vice president of operations, the automaker will have about 100 different variations on offer in the U.S. It would be difficult, if not impossible, to keep such a large number of vehicles at each dealership, so BMW plans to create regional fleets of demo cars for potential customers. BMW is not alone in its movement to a friendlier auto showroom floor. For example, Volkswagen's Audi deployed 2,000 iPads in its dealerships to assist with car presentations, reports the WSJ. The luxury brand may take things a step further by introducing "virtual stores" where customers would be able to customize different models on giant wall-sized displays. American carmaker General Motors is also working to get technology on the showroom with so-called "connection centers" that offer interactive tech support via tablets and displays hooked up to an Apple TV or Google's Chromecast. "Think of them as our version of the Apple Genius Bar," said Alicia Boler-Davis, GM's SVP of global quality and customer experience.